Svalbard, the Norwegian islands that are home to the Svalbard Global Seed Vault aka the Doomsday Vault, has warmed up to 5 degrees Celsius (9 degrees Fahrenheit) since 1971. But according to the new report, which draws on existing studies and data as well as new targeted modeling, it could see temperatures ratchet up another 10 degrees Celsius (18 degrees Fahrenheit) by 2100 if carbon pollution continues unchecked. 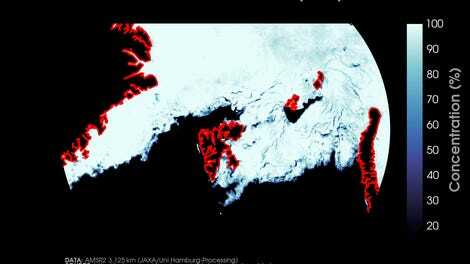 That would precipitate major changes to sea ice, permafrost, and glaciers that dominate the landscape. The Arctic is the fastest warming location on Earth, and Svalbard has already seen dramatic changes. In addition to the spike in temperatures, the islands have seen a drop in sea ice, particularly in fjords, a 20-day shrinkage of snowfall season, and permafrost warming at rates of 0.15 degrees Celsius (0.27 degrees Fahrenheit) annually since 2009. That warming signature can be detected down to 80 meters (262 feet) below the surface. And if humans continue burning fossil fuels at rapid clip, the aforementioned eye-popping 10 degree Celsius (18 degree Fahrenheit) uptick in temperatures will set off a series of changes that will ripple out through the islands. Under the worst case scenario, by century’s end, glaciers will retreat into the mountains by 400 meters (1,312 feet), and permafrost will turn to mush and release carbon dioxide and methane. Those twin trends will in turn destabilize the landscape and, along with more rain and less snow cover, likely lead to more avalanches and landslides. The only silver lining is that sea levels will drop as the islands spring up in response to being relieved of the weight of glaciers. Under a more moderate scenario where the world’s carbon emissions decline by midcentury, Svalbard is “only” looking at 7 degrees Celsius (12.6 degrees Fahrenheit) of warming. Only 2,300 people call Svalbard home, but even so, the impacts on locals can’t be ignored. The changes also mean polar bears, seals, and other animals that live on the remote outpost will also face major risks. And of course there’s the flashiest resident of Svalbard, the Doomsday Vault. 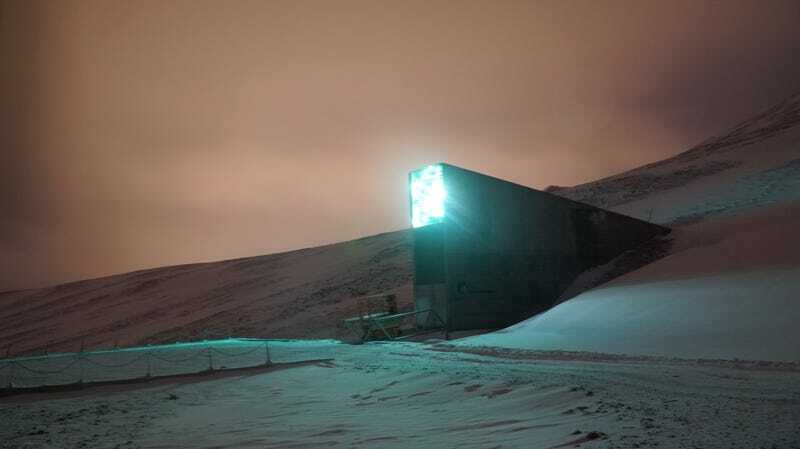 Drilled into the side of a mountain, the seed bank is managed by the Norwegian government, Crop Trust, and the Nordic Genetic Resource Center. It can hold up to 2.5 billion seeds, and the cold climate is a key component to keeping the seeds in viable condition. The permafrost acts as natural insulation and the temperature inside is kept at a brisk minus−18 degrees Celsius (o degrees Fahrenheit). The whole purpose is stash away crop seeds in a safe place in case of environmental catastrophe. Yet climate change has already led the vault’s owners to plunk millions of dollars into renovations to keep up with climate change. The vault also had a flood scare a few years ago, driven by hotter-than-normal temperatures thawing the permafrost around it. The new report shows even with all the recent upgrades, it still may not be enough to keep the seeds on ice.